Good morning. I was with many of you just three weeks ago, enjoying your hospitality and good company, at the Hong Kong Institution of Engineers annual dinner. That night, I talked about a few of the many areas in which engineers make a profound contribution to Hong Kong. I also mentioned an opportunity that, as I said then, "holds boundless promise for the engineering profession". That, of course, is the country's Belt and Road Initiative. 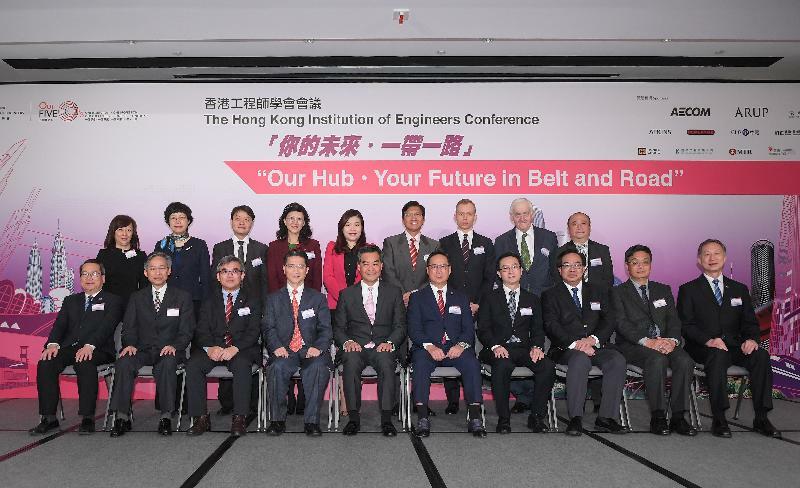 As today's conference theme most fittingly suggests, the Belt and Road is indeed the future - the future of engineers, and the future of Hong Kong. The Belt and Road is one of the most ambitious projects in the 21st century, embracing more than 60 countries on three continents, covering 4.4 billion people, and accounting for over 30 per cent of global economic value. It is also multifaceted, encompassing infrastructure, finance, trade, and people to people exchanges. To be sure, the Belt and Road is a long-term vision, and that will drive the development of the world in the next two to three decades. Including, of course, that of Hong Kong's. When Mr Zhang Dejiang, Chairman of the Standing Committee of the National People's Congress, attended the Belt and Road Summit in Hong Kong last May, he said in his keynote speech that Hong Kong is, I quote, "a key link for the Belt and Road", unquote, and that, I quote again, "the Central Government has made it a major policy to support Hong Kong's participation in the Belt and Road development". Unquote. In particular, the Chairman highlighted Hong Kong's advantages in professional services - infrastructure development, financial services, engineering, consultancy, accounting, law and others. Our professionals are, after all, highly regarded not only for their professional expertise and competence, but also for their professional ethics and global connection. And we have the combined advantages under "one country, two systems" - close ties with the Mainland coupled with rich experience and expertise in working with the rest of the world. All these have given Hong Kong an edge in servicing infrastructure developments - one of the five areas of connectivity under the Belt and Road Initiative. As China's international financial centre and the world's China financial centre, Hong Kong is well positioned to finance the massive infrastructure projects along the Belt and Road. To start with, our stock market is one of the world's largest, topping global ranking in equity funds raised through initial public offerings. It helps, as well, that we are the world's largest offshore Renminbi business hub, as the Renminbi is likely to emerge as a key currency of exchange among Belt and Road companies and projects. It is no secret that a number of Belt and Road dedicated infrastructure funds are being established in Hong Kong, thus reinforcing our hub status in implementing infrastructure projects overseas. Our aspiration as the Belt and Road's financing centre got a major boost, just two weeks ago, with the approval of Hong Kong's membership of the Asian Infrastructure Investment Bank, the AIIB. This will put a spotlight on Hong Kong and what we can offer - project loans, bond issuance, treasury management, private equity investments and many others. Meanwhile, the Infrastructure Financing Facilitation Office, or IFFO, under the Hong Kong Monetary Authority, has built up support for the industry to invest in infrastructure projects. The IFFO now boasts some 60 members - ranging from multilateral financial agencies, development banks, private and public sector investors, to insurance companies and professional service firms - all keen to ride the wave of Belt and Road opportunities. More than capital is needed to get the Belt and Road projects off the drawing board. Engineers, architects, planners, builders, project managers, consultants, operators - these are the professionals who get things up and running, who turn vision into reality. And we are not exactly starting from scratch. Indeed, quite a few of our local professional firms are well established in the Belt and Road countries, including India, Vietnam, Thailand, the United Arab Emirates and Saudi Arabia, among others. To help Hong Kong professionals enhance competitiveness and build connections with the Belt and Road counterparts, I announced the creation of a $200 million Professional Services Advancement Support Scheme in my Policy Address last year. The programme, now up and running, supports professionals in their exchange, co-operation and publicity activities targeting overseas markets, including those along the Belt and Road. I encourage you to take good advantage of it. At your annual dinner, I talked at some length about the infrastructure projects that the Hong Kong Government is taking forward. But more than hardware, what we have been promoting to the world in the past couple of years is our expertise in managing transport facilities as well - railways, highways, ports and airports. These management services are certainly in demand in many Belt and Road countries, especially emerging economies. Last year, we set up the MTR Academy, a training and research centre for the railway industry and professionals from Hong Kong, the Mainland of China and around the world. We are now in discussion with rail operators from a number of Belt and Road countries on providing training programmes for their railway professionals. Last year, as well, we opened the Hong Kong International Aviation Academy to groom aviation talents. The Academy already signed an agreement with France's National School of Civil Aviation to jointly develop an air transport management programme. More is on the way. This February, the Secretary for Transport and Housing led a delegation to London and Hamburg to promote Hong Kong's maritime services. The delegation, comprising members from the Hong Kong Maritime and Port Board and the maritime sector, met with representatives of the local governments and the maritime industry to explore collaboration opportunities. So Hong Kong has much to offer to the Belt and Road Initiative. And the Government will continue to support our businesses and professionals in pursuing opportunities in Belt and Road countries. Last year, we set up a dedicated Belt and Road Office and appointed a Commissioner. In this year's Policy Address, I announced that we will expand the Office and give it considerably more resources to execute business plans. I am glad that the country's Central Authorities have given Hong Kong full support in participating in the Belt and Road. We are discussing with the Authorities on how we can participate jointly in Belt and Road projects, and are preparing to take part in the Belt and Road Forum for International Co-operation to be held in Beijing next month. Last month, Premier Li Keqiang announced in the Hong Kong and Macao section of this year's Central Government work report the launch of a joint study to prepare a development plan for the Guangdong-Hong Kong-Macao Bay Area. This region, at the southern tip of China, is a strategic point of the 21st Century Maritime Silk Road. It presents ample opportunities for all the 11 cities in the region to work together. And one area of collaboration is clearly the joint exploration of overseas markets between Hong Kong and Guangdong, with Guangdong providing the construction works and Hong Kong the professional services, including contract negotiation, contract management, project management and facilities management. Ladies and gentlemen, I thank the Hong Kong Institution of Engineers for organising today's conference. Hong Kong is a wonderful playing field for engineers, and this wonderful playing field is getting bigger beyond Hong Kong. I wish you the best of success in the coming year, and long down the Belt and Road. 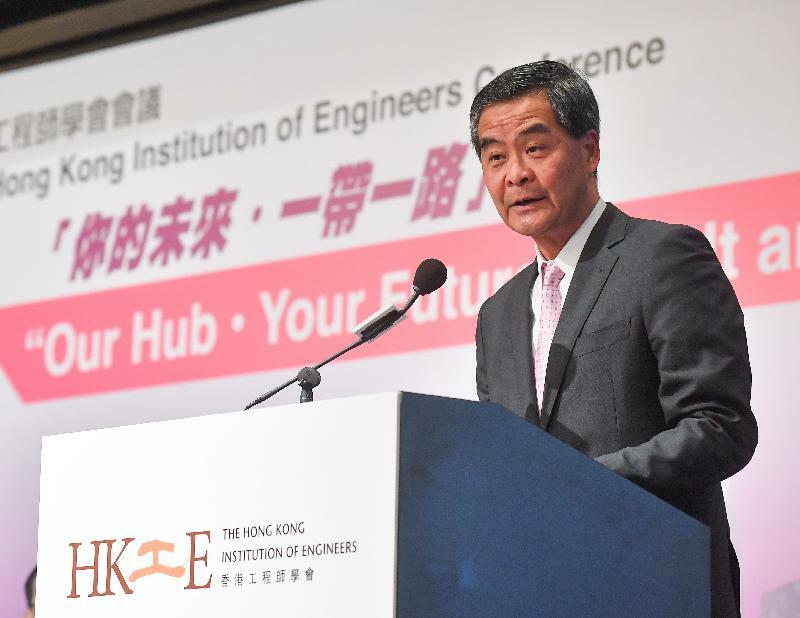 CE attends Hong Kong Institution of Engineers Conference - "Our Hub‧Your Future in Belt and Road"